When to book a newborn baby photographer? “When is the good time to book a newborn baby photographer?” Some parents are not sure how the photo session will be processed with just knowing the due date. Not everyone comes to the world on time! Some people may think that they should wait for booking a newborn photographer until right after the baby is born. Most professional newborn baby photographers will have a limited amount of session per month in order to be flexible with the actual birthday. Most of our clients bring their newborn at 5-14 days old. We have to have some space in our schedule. At Kimi Photography, we usually tentatively reserve the session date for our client and get notifications by parents. This way, we know how many newborns are coming in the month and we can be flexible and adjust the session date. I also explain the process for the photography session at the free consultation before booking. This couple came to Kimi Photography to capture their maternity pictures. They also booked us as their baby’s newborn baby photographer. A few days after the delivery, they visited our studio in Portland. For a baby boy, some parents are planning to get circumcised. We ask parents to plan it after the newborn baby photography session. 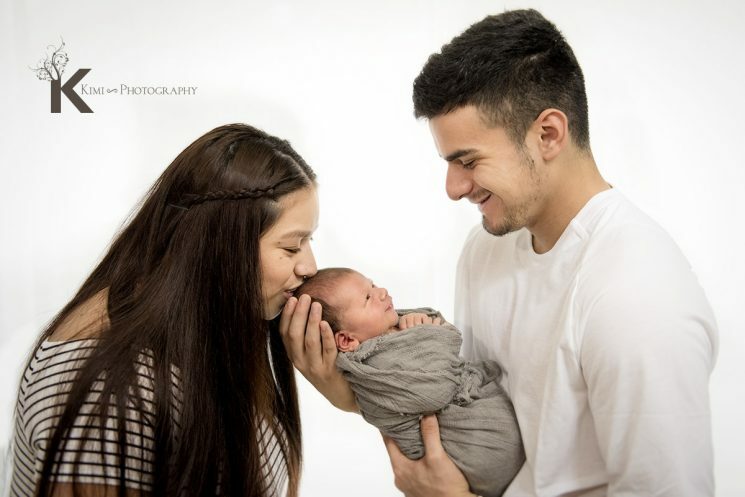 It is very joyful to see them again and capture happy parents with the healthy baby as a newborn baby photographer. At Kimi Photography, we usually try to capture the detail shots in case our clients want to make an album. It is not necessary to have those detail shots for wall arts, but I believe it is nice to have those on an album. It is never to be late to start capturing your baby’s history by photography. However if you know you don’t want to miss any moments, please book your newborn baby photographer in advance. I sometimes get bookings 6 months before the baby’s due date. Also, we have belly to baby special available for whom wants to have a maternity session. Please contact us for more details!